Lieutenant Clio Fin is third in command and a dedicated scholar. Her mission is to observe and record Creaturehood history as it happens. She see’s history as a living thing. Clio uses her historical knowledge to help make current decisions for the Condor Crew. She truly believes that applying perspective and learnings from the past can help save the future. Clio’s most useful tool and favorite possession is her Shell Library. Passed down from her father, Nabu, it contains the most crucial and least obvious moments the Creaturehood history. Lieutenant Fin loves all kinds of stories. During her rare time off, she tends to binge stories through movies, books, and TV shows. Being a goldfish, Clio must stay in a watery environment. A water bubble constantly surrounds her so she can breath. 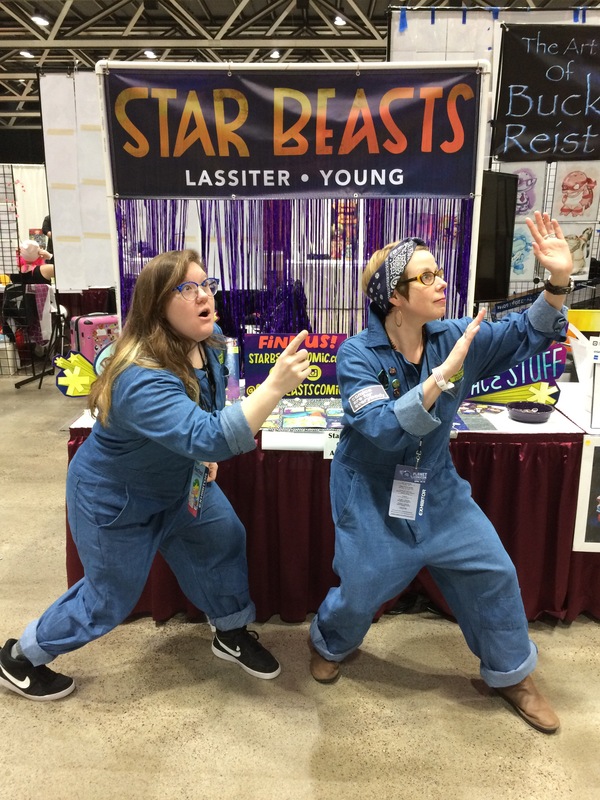 Star Beasts at Library Con! The Condor Crew will be at Library Con 2017! If you’re in Springfield MO swing by the Greene County Library Center for the super stellar Library Con on August, 19th. Not only can you meet all kinds of writers and artists, you (yes, you!!) 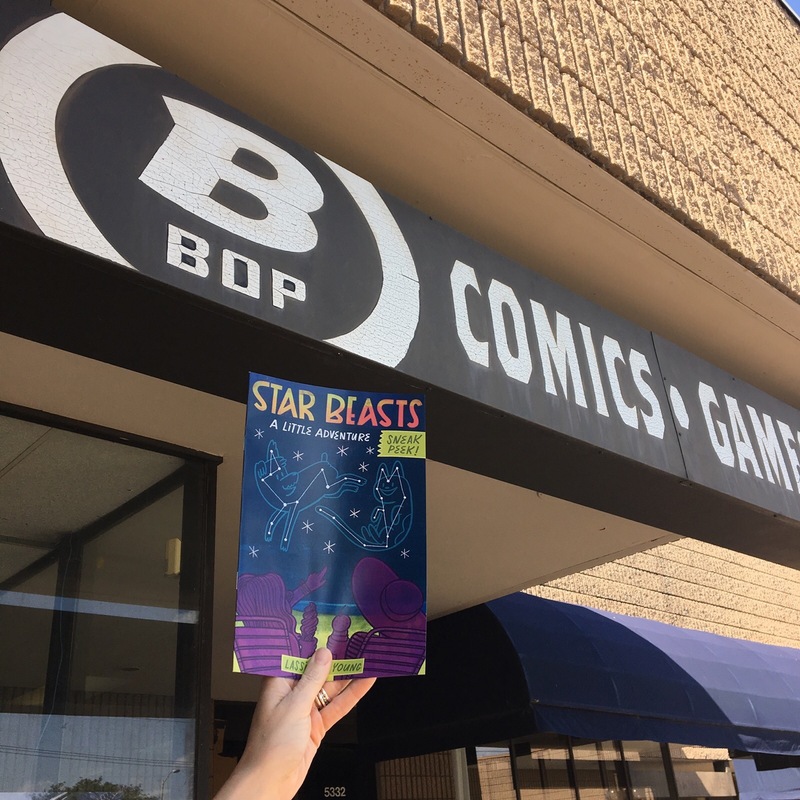 can check out out new Star Beasts swag and FREE SPACE STUFF! 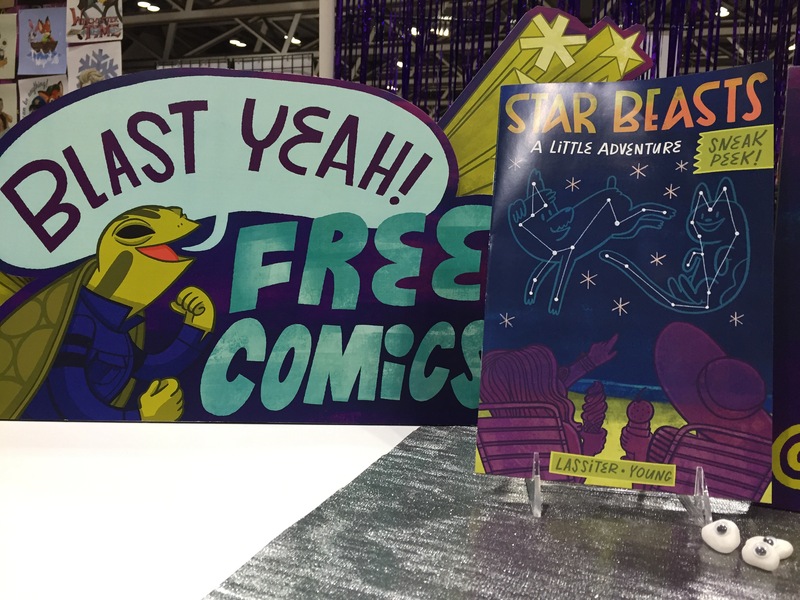 Lassie and I will also be telling the Star Beasts origin story and other tales at the Origin Stories panel from 4-5. The panel will feature other creative creatures and is hosted by The Comic Cave’s very own, Josh Roberts! The Library Con’s hours are from 11AM-5PM and the events are for all-ages. Meteor-mazing!! We visited the fantastic Vintage Phoenix in Bloomington, Indiana. If you’re ever passing through the Hoosier state stop by the fine store. 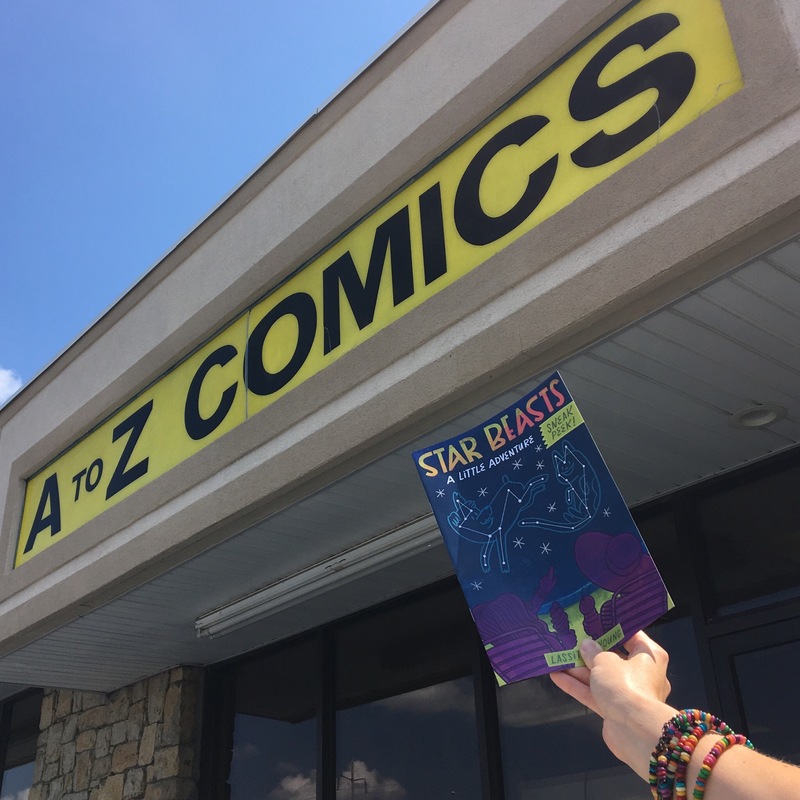 Not only are they out-of-this-world fun, they’ve got a great selection of comics– including our own Crewcreature friends! Vintage Phoenix love animals. They even help animals find their homes, no matter what they’re made of! Recently, they’ve tried to reconnect a lost stuffed lamb found in the street with her human friend. Check out the whole story at Vintage Phoenix’s Facebook page! Fun space stuff, coming soon! Hey friends! We are working hard over here on the first issue of Star Beasts, but we’re also working on some other fun space stuff too! I wanted to give you a little preview of some new character art that will be featured on a couple of things available in the near future! Can’t wait to show you what these become! But for now, I’ve gotta blast off and draw some adventures! Blast Yeah, KC! The Condor crew has arrived in all your favorite comic book stores. 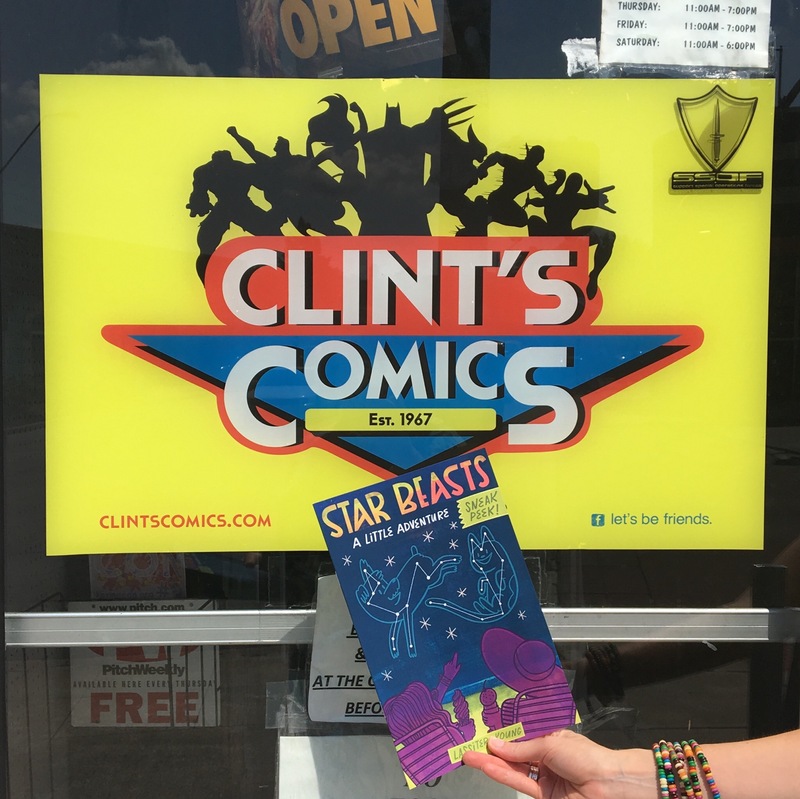 Grab your free copy today and, hey thank these nice local comic book supporters for giving Star Beasts a chance! 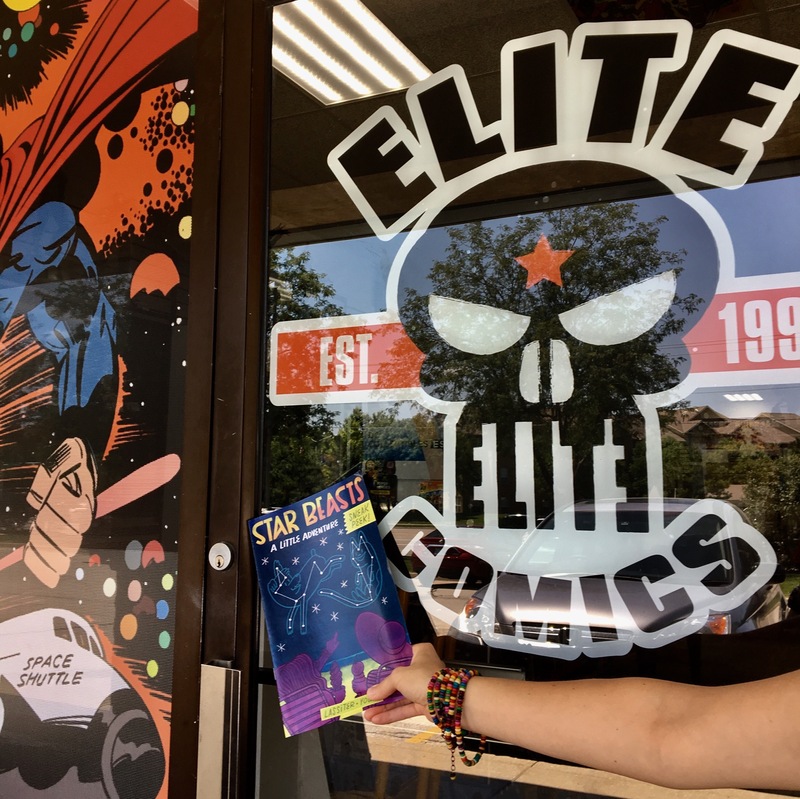 Thanks again KC Metro comic book stores. 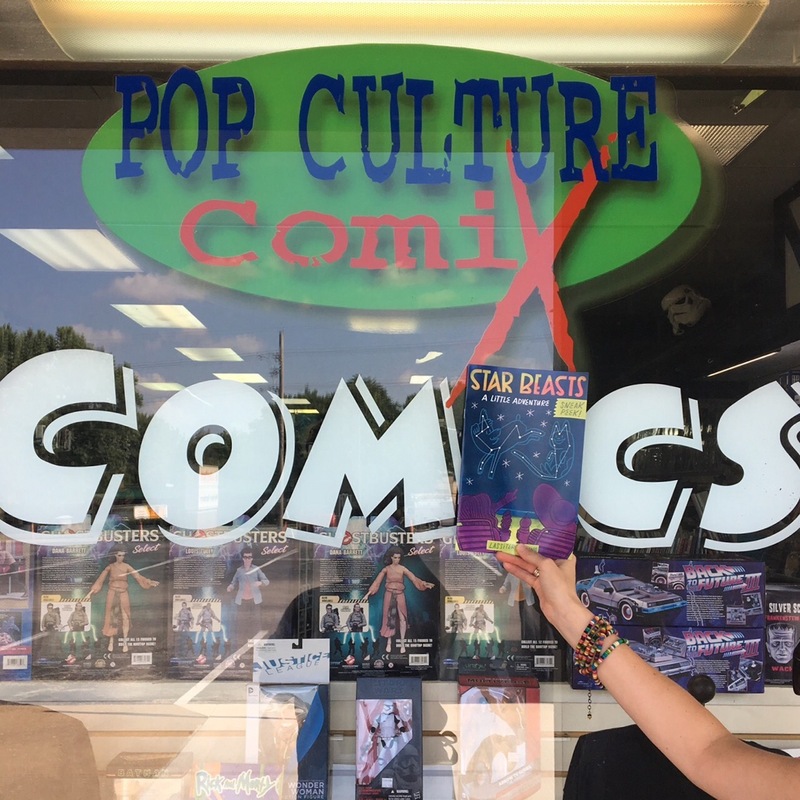 You’re rockin our Star Beast galaxy!